At this time of year when we are all thinking about our holiday menus, I wanted to share a classic salad of mine, which I’ll be serving on my festive table this year. Brussels sprouts are my Christmas (and thanksgiving) essential - I cannot prepare a holiday feast without them. Usually I roast my sprouts, but if you are looking for a way to free up oven space, this hearty, crowd-pleasing salad is the ultimate ‘green’ salad! For vegans, use a good quality vegan mayonnaise (and skip the sour cream and parmesan). This recipe appears in my book Neighbourhood (published by Plum Books / Roost Books). For more festive (and everyday) salads and sweets, purchase the book here in Oz and here in USA. Preheat the oven to 200ºC/400ºF. Coat the bread in 1–2 tablespoons of olive oil and sprinkle with salt. Spread over a large baking tray in a single layer and bake in the oven until golden, about 15–20 minutes, turning every now and then to make sure the croutons are evenly browned and crisp on all sides. Cool. While the croutons are baking, make the caesar dressing. Add the unpeeled garlic cloves to the oven and cook for 20–25 minutes until they are very soft. Remove from the oven and peel off the skins, then mash the soft garlic flesh with the back of a fork and mix it together with the mayonnaise, sour cream, capers, lemon juice and 3–4 teaspoons of water. Season to taste with salt and pepper and – if you like it more garlicky – add half a very finely chopped raw garlic clove. Using a mandoline or the grater attachment on the food processor, very finely slice the brussels sprouts. Combine the sliced brussels sprouts with the borlotti beans, red onion, herbs and half the sunflower seeds. Add the caesar dressing, season with salt and pepper and mix everything well to make sure the ingredients are well coated. 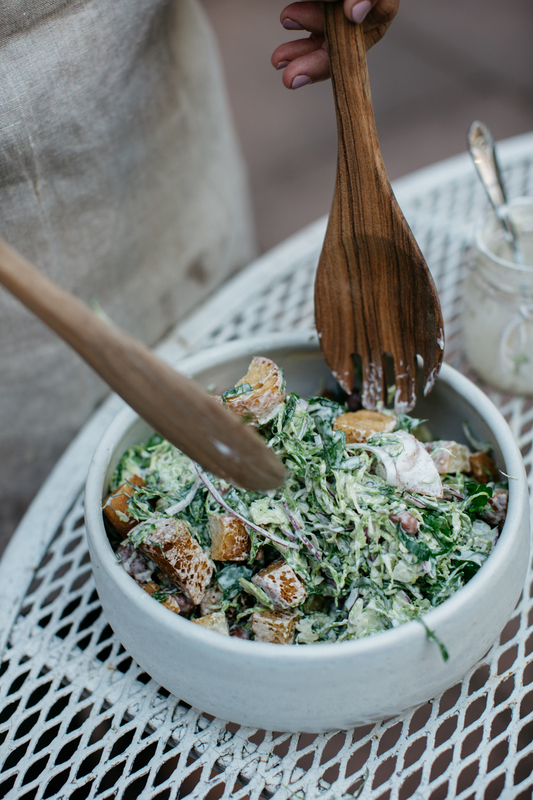 Leave the salad to sit for 15–20 minutes to allow the brussels sprouts to soften and the flavours to meld together. To serve, fold through the croutons and sprinkle over the parmesan shavings and remaining sunflower seeds.